Basil King wrote the bestselling novel of 1909. That novel, The Inner Shrine, was published anonymously. Its story of a woman's reputation sullied by the base claims of a cad captivated readers almost as much as the mystery of its authorship. Speculation centred on Henry James, Edith Wharton and the daughter of William Dean Howells as King kept to the shadows. 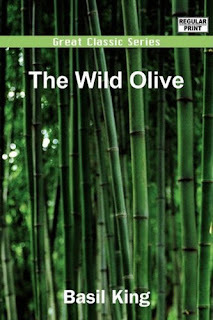 When The Wild Olive appeared the following year it was credited only to "the author of 'The Inner Shrine'". I'll be damned if the new work didn't do nearly as well. 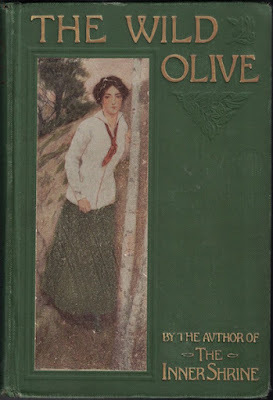 In its summary of sales for 1910, Publishers Weekly placed The Wild Olive third, behind Florence L. Barclay's The Rosary and A Modern Chronicle by Winston Churchill. Basil King book I've ever read. It begins in mystery: a barefoot man, a fugitive, scrambles through darkness in the Adirondack wilds. Coming upon a tasteful, well-appointed house, he walks through open doors to find Judge Wayne, the very man who had just hours before sentenced him to death. A great coincidence, I know. There will be others. The fugitive – name: Norrie Ford – only entered the house because he thought he'd heard a noise made by one of his pursuers. 'Twas in fact the light tread of a lithe young woman dressed in white. Silently, she beckons Ford back outside, then leads him in silence to a remote artist's studio somewhere in the vicinity of Lake Champlain. There he's left, hidden from the law, surrounded by sketches and watercolours depicting trappers, voyageurs, Indians and nuns. The woman in white reappears daily, bringing food, clothing and companionship of a sort. The clothes she brings belonged to her deceased father, a Virginian who made a great deal of money in the northwest of Canada. "I was born on the shores of Hudson Bay," she tells Ford. "My mother was married to a French-Canadian voyageur." Not a suitable topic for polite dinner conversation, perhaps, but Ford's saviour is proud of her past. Her present, however, is off-limits; she won't reveal so much as her name. In her eagerness to buy the domestic place she had not inherited she reminded him of something he had read or heard of the wild olive being grafted into the olive of the orchard. "He was very cruel to you – your uncle? – wasn't he?" she asked, at last. "He was very cantankerous; but that wouldn't be a reason for shooting him in his sleep – whatever I may have said when in a rage." "I should think it might be." He started. If it were not for the necessity of making no noise he would have laughed. "Are you so bloodthirsty – ?" he began. "Oh no, I'm not; but I should think it is what a man would do. My father wouldn't have submitted to it. I know he killed one man; and he may have killed two or three." number of days – a couple of weeks, I'm guessing – she serves as guide through dense forest to the shores of Lake Champlain. There he's handed a plan of escape to Canada, complete with canoe, map, money, train schedule and a ticket for England on RMS Empress of Erin (read: Empress of Ireland). And so, Norrie Ford is given a second chance at life as "Herbert Strange", the... er, unusual name recorded on the steamer ticket. In this effort to make something of himself, Ford follows the mystery woman's suggestion that he make for the Argentine. "I happen to know a lot about it," said she. "Everybody says it's the country of new opportunities." Indeed, it is. On a whim – he recalls passing mention made by the wild olive – the newly christened Strange seeks employment with Stephens & Jarrott, an American firm with offices in Buenos Aires. Eight years pass. 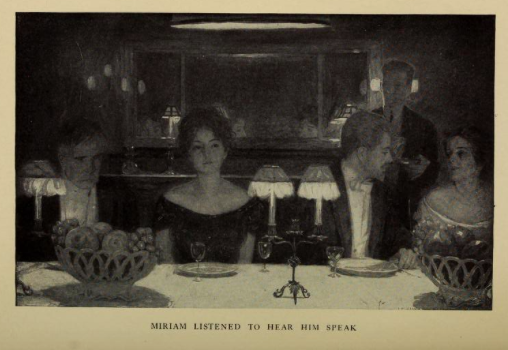 Strange rises through the ranks, becomes engaged to a Jarrott relation, is transferred to New York, and then attends a dinner party at which he is seated to the left of the wild olive. To her right is Judge Wayne. Not bad, actually. One expects coincidences in an Edwardian novel, and there are several here, but setting aside the first, none beggar belief. 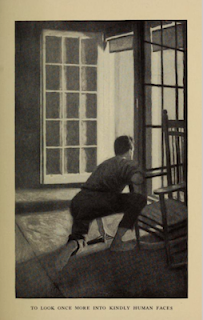 The mystery woman's casual reference to Stephens & Jarrott, a firm to which she has the thinnest of connections, set Ford on a course that would bring him back to her. It was all quite unintentional on her part, but there you are... rather there he is. I won't say any more for fear of spoiling the plot – it's so remarkably clever – except to say that the final page came as a complete surprise. The Wild Olive doesn't end so much as trails off leaving so many mysteries intact. What sent the wild olive's father to prison? How did her mother get him out? What of her French-Canadian husband? How did Ford escape his jailers? For goodness sake, what happened to his shoes? "You can't realize what all this means to me. If we succeed – that is, if you succeed – I hardly dare to tell you of the extent to which I shall be grateful." He felt already some of the hero's magnanimity as to claiming his reward. "You needn't think about that," he smiled. "I sha'n't. If by making Evie happy I can serve you, I shall not ask for gratitude." She looked down at her muff and smoothed its fur, then glanced up swiftly. "No; but I shall want to give it." Trivia I: The most sympathetic character in the novel is Judge Wayne, a good soul who recognizes and struggles with the injustice of the justice system. When first we encounter the man – during Norrie Ford's first night on the lam – we see that he is going blind. Because he is beyond the help of the best German oculists, "poor Wayne" has descended into darkness by the time he and Ford share the same dining table. Ah, but the judge's hearing has grown more acute, right? I spoil things in revealing that he recognizes Ford's voice. However, Wayne keeps the knowledge to himself, choosing not to turn Ford in because, of course, justice is blind. King himself was going blind when he wrote this novel. 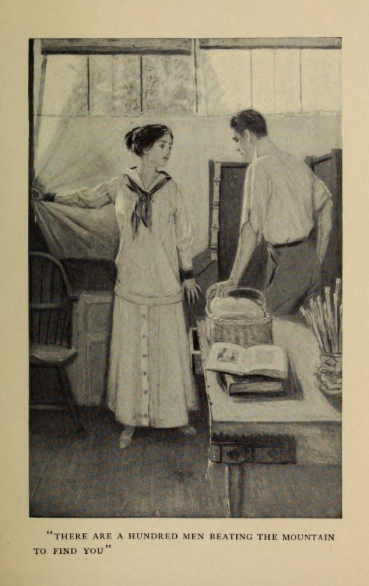 Trivia II: In 1915, The Wild Olive became the first of seven Basil King novels to be adapted to the screen. 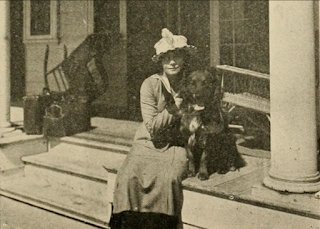 A lost film, one of the very few images known to have survived is the publicity shot above of silent film star Myrtle Stedman as the Wild Olive. In the novel, she has a dog named Micmac. Forgotten English actor Forrest Stanley plays Norrie Ford. Object: An attractive 346-page hardcover with eight illustrated plates by Lucius Hitchcock (who also provided illustrations for The Inner Shrine). My copy, a first edition, was purchased last month at Ottawa's Patrick McGaherne Books. Price: US$20. Access: The Prince Edward Island Public Library Service succeeds were all other public libraries fail. Twenty-seven of our academic libraries have it in their holdings. Curiously, a third are found in Alberta. Loads of copies being offered online at prices ranging from US$5 to US$564. Ignorance and greed aside, there is no reason for the wide range. Anyone looking to invest in a copy is warned that the Harper edition went through numerous printings, and was followed by a cheaply produced Grosset & Dunlap reissue. Those considering the later are warned that it features only one of the eight plates. Speaking of ignorance and greed, print on demand vultures have been all over The Wild Olive. This post gives me an excuse to share an absurd old cover (right) from defunct Tutis Classics. Good news is found in the fact that The Wild Olive can be read and downloaded here at the Internet Archive. I must add that an excellent audiobook recording read by Simon Evers is available gratis here through Librivox. Recommended! 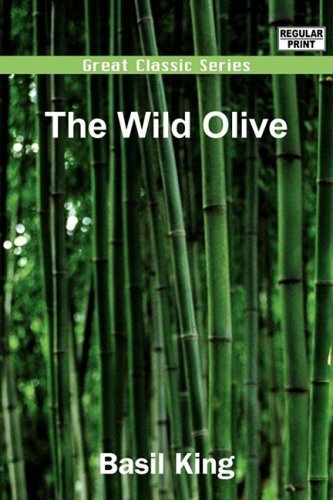 The Wild Olive made a bigger impression on me, Susan, but I expect I won't be rereading it either. What kept me going were the intricacies of the plot and the expectation that the mysteries of our heroine's life would be exposed. Five dollars seems a bargain to me... but then I'd been looking for the book. I'm betting it was on that shelf for a good long while. Read This. Don't Get It Wet.